Eupatorium rugosum.www.muhlenberg.edu. C. Friedl, Muhlenberg College (Accessed 4/2014). 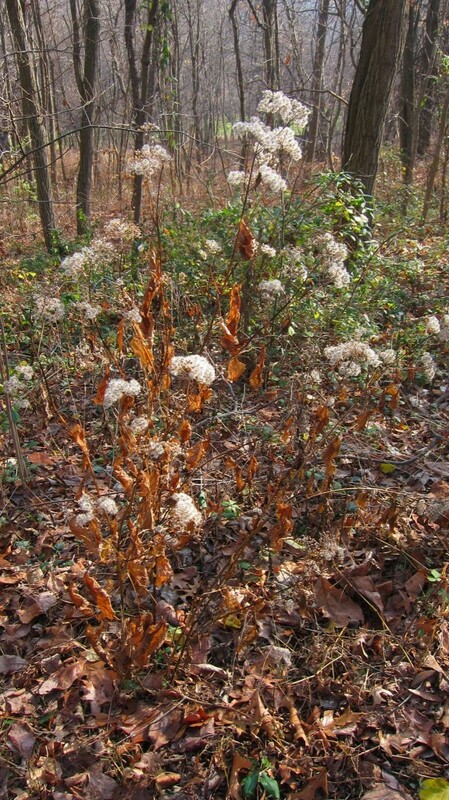 Ageratina altissima is a perennial herb, 30-150 cm tall, stems 1-3 together, from a knotty root crown, stems usually hairless below inflorescence. Plant poisonous (Kingsbury 1964). Leaves opposite, stalk 10-30 cm long, blade 6-18 cm long, 3-12 cm wide, rather thin, egg-shaped, tip long-pointed, margin coarsely toothed. Ageratina altissima close-up. By Steven Baskauf. Copyright © 2017 CC-BY-NC-SA. New England Wild Flower Society. gobotany.newenglandwild.org (Accessed 7/2017). 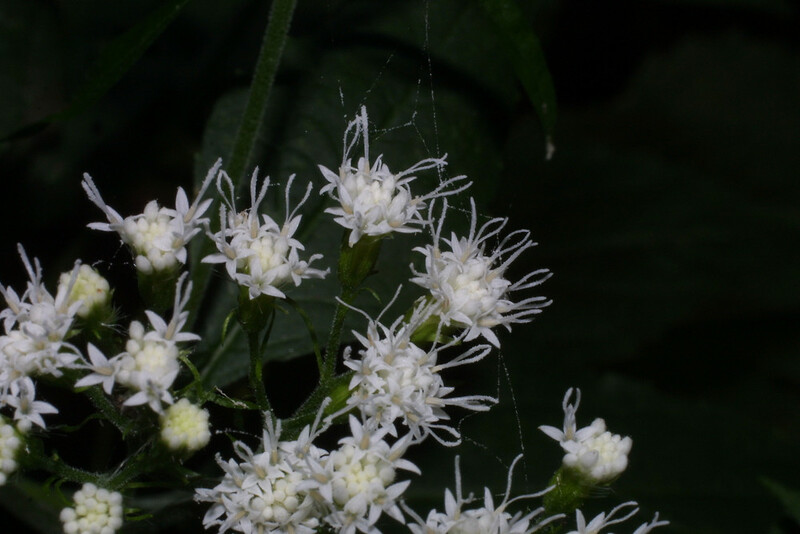 Flowers bright white, 12-25 per head, no rays, bracteate base 0.3-0.5 cm tall, bracts in 2 rows, sub-equal; inflorescence branched, flat-topped; blooms Aug.-Oct.
Fruit dry, 1-seeded, 5-angled plumed achene, wind dispersed, seeds eaten by some birds (Martin et al. 1951). 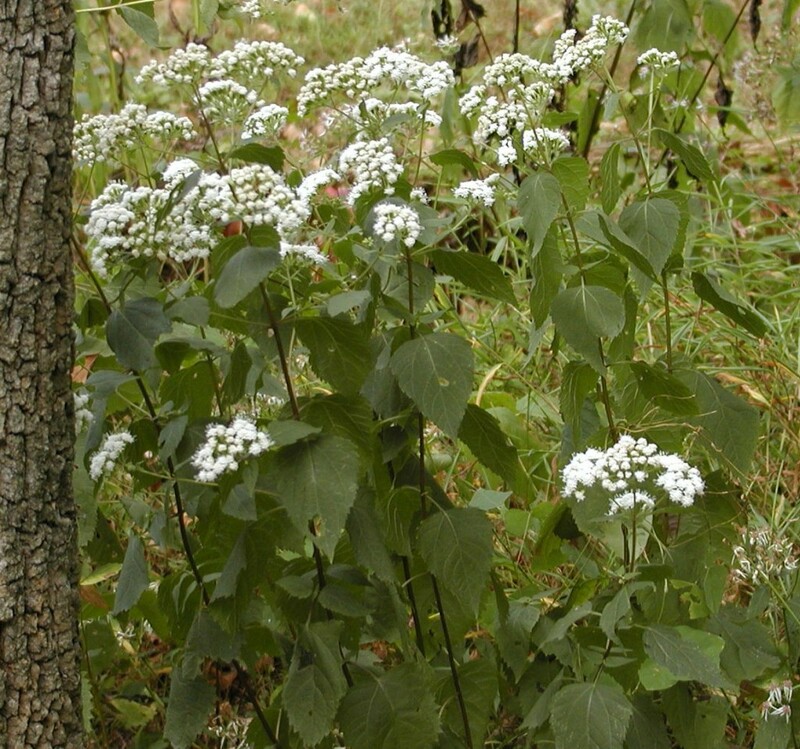 Habitat: Disturbed, upland woods, along wooded margins of highways, stream corridors; shade and drought tolerant. Tolerant of urban conditions and disturbance. Notes: Toxic to deer, so not eaten. Formerly caused poisoning when milk from cows that had eaten E. rugosum was ingested. The toxin is a phenolic and can be lethal. (Kingsbury 1964). Also contains barium sulphate which is toxic in quantity (Yatskievych 2006).